Straightforward upgrades and competitive trade-ins for current and new SonicWALL customers! 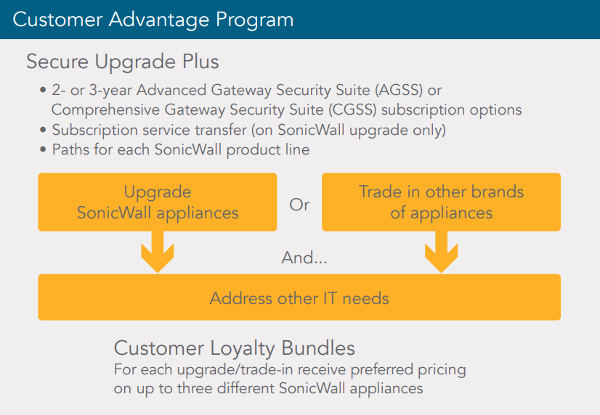 The SonicWALL Customer Advantage Program offers an upgrade path from current SonicWALL products, and a tradein path from competitors' products, in addition to special pricing on a wide range of SonicWALL products. This offer recognizes the past investments that customers have made and helps them maintain optimal security by letting them easily and affordably replace outdated security appliances. Customers who purchase the comprehensive subscription services and support option when upgrading a SonicWALL product or trading in a competitive product can save up to 50 percent on the total annual cost of that solution, compared to the cost of buying the hardware separately and renewing services each year Subscriptions are available in two- and three-year terms to maximize savings. The Customer Advantage Program is comprised of two different offers: Secure Upgrade Plus (which covers SonicWALL upgrades and Competitive Trade-Ins) and the SonicWALL Loyalty Bundle offers. Secure Upgrade Plus is designed for current, qualifying SonicWALL customers who wish to upgrade from older SonicWALL appliances, as well as those who want to trade in appliances from other manufacturers. The Secure Upgrade Plus offer lets qualified customers and prospects trade in their old firewalls, secure mobile access and email security products for the latest SonicWALL technology in each category all at significant discounts. Additionally, for customers who make an upgrade or trade-in purchase, the Customer Loyalty Bundle offer provides special pricing on SonicWALL's other product solutions not represented in the Secure Upgrade Plus purchase. For example, a customer upgrading a firewall may also, within a limited period of time, receive special pricing on an Email Security, Secure Mobile Access, or WAN Acceleration solution and/or SonicWave 802.11ac Wave 2 wireless access points - up to one complete solution from all four categories. See Terms and Conditions for qualified upgrade paths. For details on arranging upgrades to SonicWALL high-end NSA and NSSP Series products, contact us today! Special pricing - Enables customers to upgrade their SonicWALL products, replace competitive products for SonicWALL products and obtain additional special pricing on other SonicWALL products. Financial rewards for enhancing security - Lets customers save up to 50 percent on total annual solution costs (in contrast to the cost of buying the hardware separately, plus one year of services each year) making it far more affordable and manageable to remain optimally protected with the best and latest technology available. Transfer of service and support subscriptions - Customers can transfer any remaining or unused service and support subscriptions from their old SonicWALL appliance to their new appliance (within approved upgrade paths). The transfer will equal the subscription time remaining on the old appliance. Customer Loyalty Bundle offer qualification - Customers who participate in the Customer Advantage Program are eligible for preferred pricing (30 percent less than MSRP on an appliance) on the purchase of additional products from select SonicWALL product lines. Broader choice of qualifying solutions - The Customer Advantage Program features a wide range of network security, wireless access secure mobile access (SSL VPN) and email security solutions. Flexible, efficient subscriptions options - Gives customers a choice of two- and three-year terms. Real-time breach prevention with Secure Upgrade Plus - Advanced Edition - Customers can add Capture Advanced Threat Protection service, a multi-engine sandbox to discover and stop newly developed, advanced threats as part of Advanced Gateway Security Suite (AGSS). Secure Upgrade Plus - Advanced Edition includes a new SonicWALL Firewall and a multi-year AGSS subscription that stops known and unknown, late-breaking threats to your organization. To qualify for the Customer Advantage Program, the participant must be the legal Owner of the Eligible SonicWALL Product or Eligible Competitive Product. In order to purchase either the corresponding SonicWALL Replacement Product or a corresponding Competitive Replacement Product, that Product must be (i) currently registered with the manufacturer, and (ii) listed in the Eligible Product Matrix shown below. In all cases, both customers and resellers are advised to consult the Eligible Product Matrices for each product line prior to completing any purchase. End-customer contact information must be provided at the time of registration regardless of which party (i.e., the end customer or reseller) is completing the registration process. Registration Date means the day the Owner registers the Replacement Product within a valid account on www.MySonicWALL.com. Eligible Competitive Product means the competitive manufacturer's product that the Owner has agreed to replace and remove from service and (listed in the Eligible Product Matrix below). Replacement Product means (i) the SonicWALL appliance that replaces the Eligible Product, (ii) as listed in the Eligible Product Matrix below and (iii) is purchased through Secure Upgrade Plus. Purchase and registration of the Eligible Competitive Product requires six (6) months prior ownership of an Eligible Competitive Product. As a condition of this program, the Owner agrees that he/she will dispose of the Eligible Competitive Product within sixty (60) days of the Registration Date. If proof of ownership of the Eligible Competitive Product is not available within fifteen (15) days upon written request from SonicWALL or if the Eligible Competitive Product is not disposed of within sixty (60) days of Registration Date of the Replacement Product SonicWALL reserves the right to terminate the services applicable to the Replacement Product SKU. In order to register the Replacement Product, the Owner must provide current contact details (i.e., contact person's name, e-mail address, business phone number, organization name, and physical address) and certify that all responses in the required fields of the Competitive Replacement Form are true and correct. To qualify for the applicable Customer Loyalty Offer, the Owner must participate in the Secure Upgrade Plus or Competitive Trade-in offers. Important Notice and Disclaimer: In all cases, end-users and Resellers should consult the Eligible Product Matrices for each product line in advance of any purchase. SonicWALL reserves the right to either deny or adjust entitlements to reflect any misrepresentation of eligibility. SonicWALL reserves the right to make changes to the Customer Advantage Program at any time without notice. Select SonicWALL products are included in the SonicWALL Loyalty Offer. Please contact your sales representative for details.